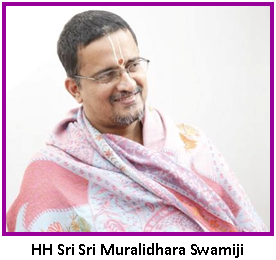 Categories: Bhakti, Kshetra, Senganoor, Sri Sri Muralidhara Swamiji, Worship. Around the time of Vaikunta Ekadasi, Sri Swamiji also gets immersed in deep thoughts of Srirangam. This year, at ashram, in the early hours of the day, along with the Dhanur month pooja (performed early morning at that time of the year), thirumanjanam (sacred bath) for Premika Varadan was performed. 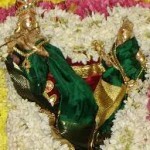 At about 8 AM, Sri Premika Varadan was taken around in procession in Garuda vahana. With all devotees doing Nama kirtan during procession, Premika Varadan went around blissfully enjoying all the proceedings, gently moving along with his consort, Sri Madhuri Sakhi. From the night before Vaikunta Ekadasi itself, Sri Swamiji had been consumed with thoughts of Vaikunta Vinnagaram divya desam (one of the 108 holy places sung by the Azhwars). It is only in this divya desam in Thirunangur, situated near Seergazhi in Tamil Nadu, that Perumal – both moolavar (the immovable main deity) and utsavar (the deity who is taken in procession) – are exactly in the same form as “Para Vasudevan” in Sri Vaikuntam. Bhagavan resides here with Sridevi, Bhoodevi and Neeladevi. (Saints never have any desires. But if a desire does arise in a saint’s heart, it is always divine and they remain restless until it is fulfilled.) As Sri Swamiji desired to have darshan of this Perumal on Vaikunta Ekadasi day, he left the ashram after the procession of Sri Premika Varadan. In the evening around 7 pm, Sri Swamiji reached the Thirunangur agama veda patasala (a center established by Sri Swamiji to train students in temple scriptures and the Nalayira Divya Prabandham, the 4000 verses sung by the Azhwars). From there he went to Vaikunta Vinnagaram and had darshan of Perumal. Sri Swamiji’s happiness knew no bounds! He wanted to have a dip in the holy waters of the thatakam of the divya desam, known as Viraja Theertha. However, there was no water in the thatakam. From there, Sri Swamiji went to Semponsey temple and had darshan of the Perumal there. Before even Sri Swamiji arrived, many devotees there were doing the Mahamantra kirtan! After the darshan there, that night, he went to Govindapuram and then to Senganoor the next day for the divine star, Rohini.